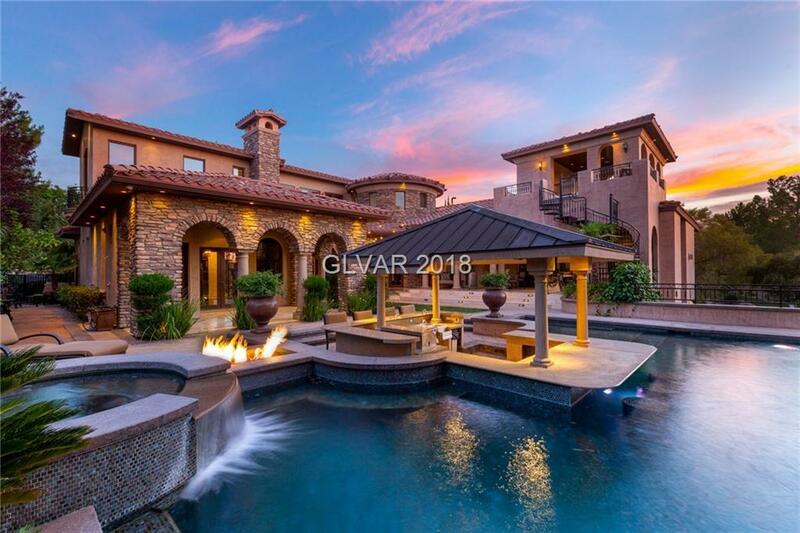 This 7,420 sqft custom home in Anthem CC showcases a gorgeous indoor-outdoor great room combined with a gourmet Wolf kitchen, 4 bedroom en suites, first-floor master w/ dual closets, home office, theater room, upstairs loft, wine cellar & covered loggia with full Strip views. The lush backyard is an entertainer's paradise with a mosaic-tiled saltwater pool, fountains, fire pits, swim-up bar, sunken outdoor kitchen, and multiple patios. Directions: S On Eastern To Anthem Cc Gg. R On Anthem Club Dr To "alvamar" Subdivision, L On Ayden, L On Sankaty. Park On Non-Sidewalk Side. Speed Limit Strictly Enforced.